When you are a vegan, stuck shopping in a mall in the suburbs and don’t want to eat french fries for lunch, P.F. 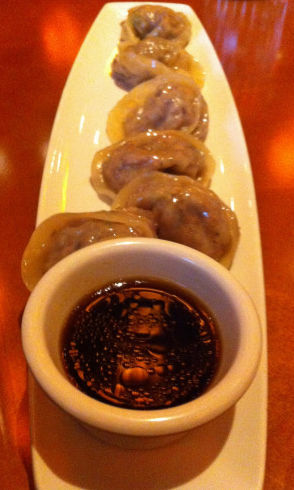 Chang’s starts to look like a non-terrible idea. It doesn’t ever rise to being a good idea but they have a vegetarian section on the menu, which has dumplings. The Dumplings. The vegetable dumplings are available fried or steamed, although somehow the steamed dumplings still came glistening with oil. The filling had a really strong ginger flavor that overpowered the otherwise nondescript vegetable filling. The Dipping Sauce. The dipping sauce was unmemorable, while the sambal chili paste was memorable for being over-salted. The Location. At a mall or airport near you. This entry was posted in Chinese, Vegetarian and tagged Chinese, Vegetarian. Bookmark the permalink.